My favorite thing about this time of year is the focus on gathering. Whether it's family or friends or even new friends like the great group I recently met at a book club meeting, the get-togethers make me feel connected. The other great part is the focus on food for all these gatherings and I love to plan a party. It can be time consuming but it needn't be complicated. I like taking simple food and adding a special touch to elevate the dish and make it company worthy. One of the easiest ingredients to elevate flavors probably already lives in your fridge because it certainly does in mind. A jar of Maille Dijon Originale mustard comes in handy for so many things and I'm not even thinking about hot dogs. A spoonful in a bechamel sauce is incredible, swirled in with some mayo to make an amazing dip or, as in this case, as a coating. 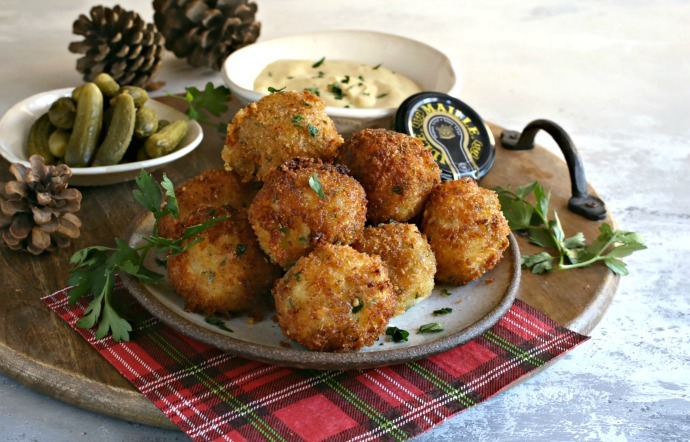 These crispy potato balls are so simple to make but, instead of dipping them in an egg mixture to adhere the breadcrumbs, I brush them with mustard instead. An egg wash doesn't add much flavor but the mustard sure does. That classic creamy mustard texture and bite of vinegar is perfect with the cheesy potatoes and makes people say, hmm, what is that great flavor? And yes, I served these at the book club meeting. Enjoy! 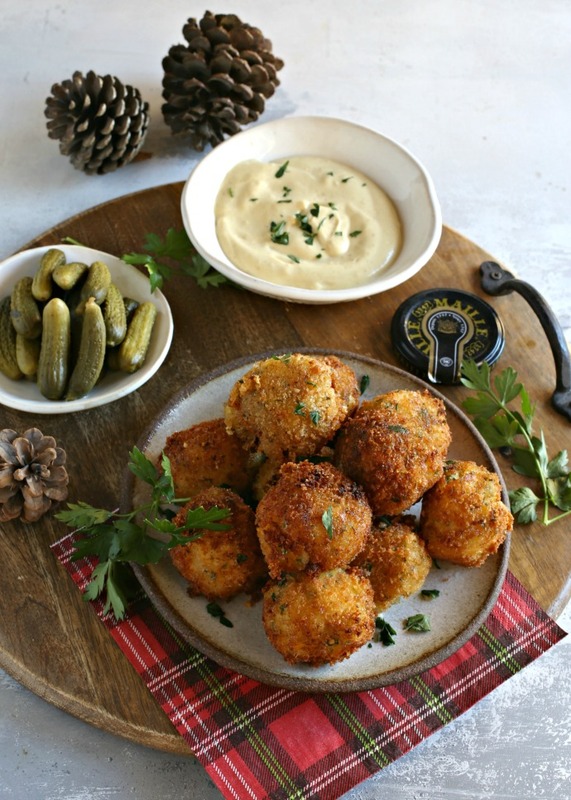 Recipe for crispy mustard coated fried potato balls with cheese. Boil the potatoes in salted water until fork tender. Drain and mash together with the butter and milk. 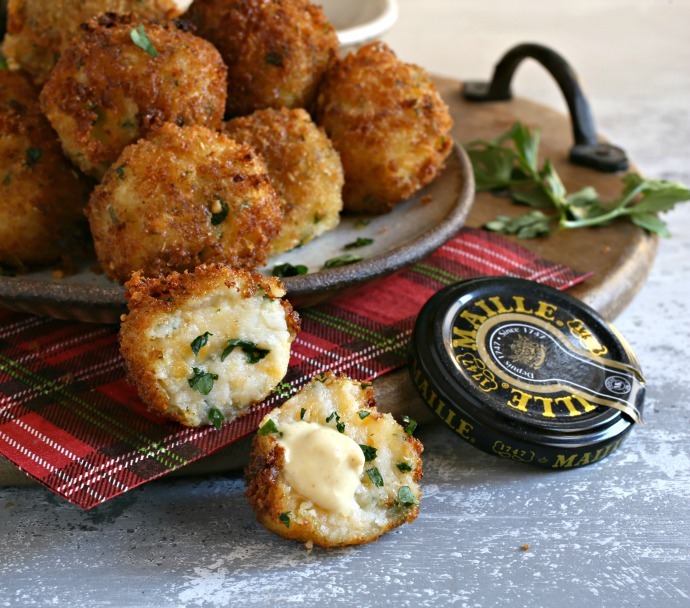 Allow to cool completely or refrigerate overnight before making the crispy balls. Stir the cheddar cheese, flour and parsley into the cool mashed potatoes and add salt if needed. Add the mustard to one shallow bowl and breadcrumbs to another. Using a 1 oz. scoop, roll balls of the potato mixture, coat with the mustard (note that it is easier to do this with a brush) and then with the breadcrumbs. 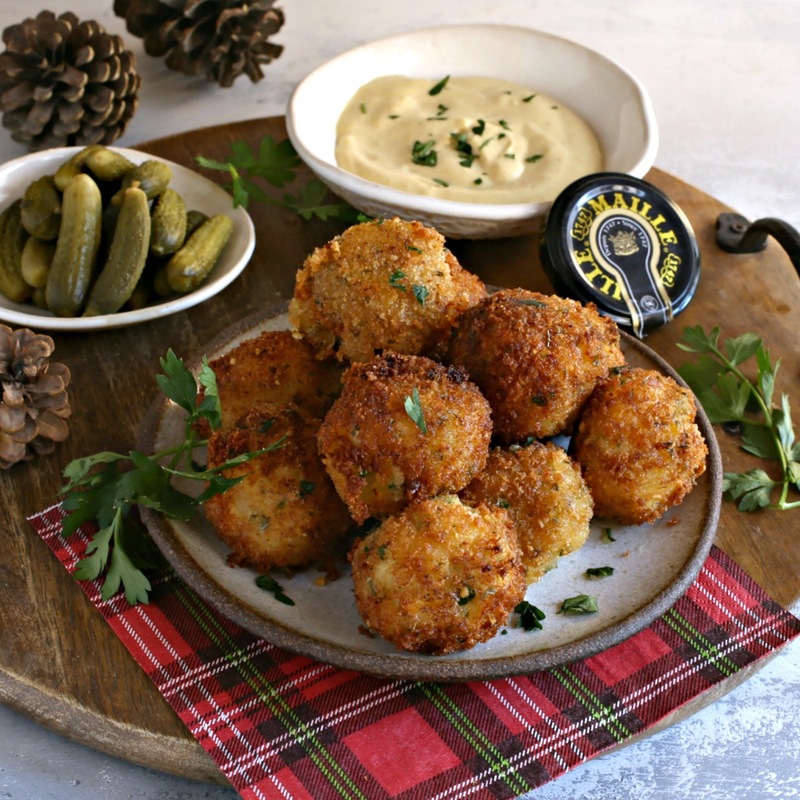 Bring about 3" of oil to a temperature of 350 degrees and fry the potato balls, working in batches to avoid overcrowding the pot. Fry for 1 to 2 minutes, rotate and fry for an additional 1 to 2 minutes or until the outside is golden brown. Drain on a paper towel lined plate and serve hot with your favorite dipping sauce. This recipe was sponsored by Maille. Thank you for supporting the products I love and use in my kitchen.